Just like the big banks, general insurance companies play a pivotal role in enabling fossil fuel expansions. They do this by providing the insurance that allows big fossil fuel projects to get off the ground and continue operating. Insurers also invest in the fossil fuel industry through their considerable share portfolios. 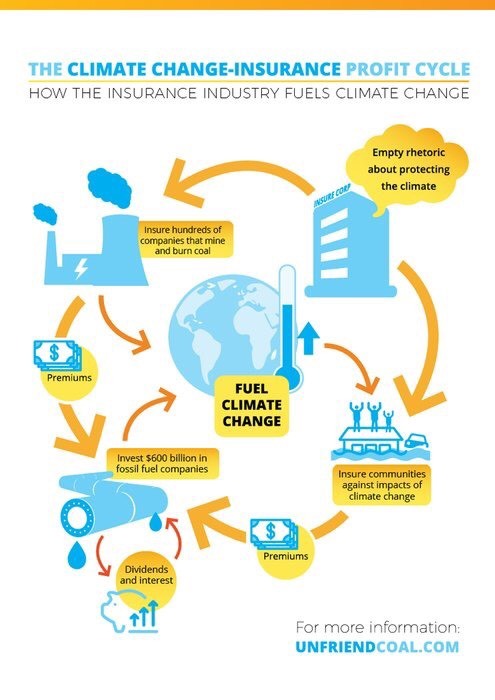 Despite the extreme weather fueled by global warming hitting insurance company profits and threatening their entire business model, here in Australia, all three major insurers (IAG, Suncorp and QBE) continue to invest in fossil fuels, while Suncorp and QBE also provide insurance to fossil fuels (Note: As of 1 July 2019, QBE will be dumping thermal coal shares and refusing to insure new thermal coal projects). For more detail see the “where does your insurer stand” table below. Australia’s big insurance companies are making extreme payouts on extreme weather, but are still invested in the fossil fuel industry that is making climate change worse. Educate customers about the effects of climate change on premiums, and participate in risk mitigation measures. *QBE and Suncorp only – IAG doesn’t underwrite fossil fuel projects. I believe in protecting and improving our natural environment and urgently working to avoid catastrophic global warming. Since 2010, Australia’s general insurers have lost billions of dollars on claims from natural disasters. Extreme weather events are increasing in frequency and severity – a direct consequence of climate change. According to Tom Herbstein of Cambridge University’s insurance project ClimateWise, “climate change fundamentally challenges the existing insurance business model because it is rendering actuary analysis in many places obsolete.” Insurance companies are facing shrinking markets and growing natural catastrophe claims. In addition the world is at a point where we need to rapidly transition away from polluting coal, oil and gas to clean, renewable energy if we are to avoid runaway climate change. Insurance companies that underwrite and/or invest in projects that worsen climate change are contributing to exposing their shareholders and customers to increased risk through higher premiums and loss of value as natural disasters become more frequent and intense. They are also actively undermining global efforts to limit global warming as exemplified by the Paris Agreement. I am writing to outline what an insurance company needs to do to align its business with the Paris Agreement and limiting global warming to 1.5 degrees: 1. Put an immediate end to underwriting of new coal, oil and gas projects. 2. Put in place a plan for phasing out all underwriting exposure to coal, oil and gas. 3. Divest from coal, oil and gas company shares and infrastructure. 4. Inform your customers on the threat of global warming to their property and affordability of insurance premiums. 5. Advocate publicly for science-based action from governments. Doing all this is in your interests as well as mine. I look forward to hearing back from you very soon about how you will align your business with keeping global warming below 1.5 degrees. Where does your insurer stand? AAMI Suncorp Invests in coal, oil and gas companies. Has committed to its fossil fuel investments being “immaterial” by 2019. Has not provided a figure for what “immaterial” represents. Does insure coal, oil and gas infrastructure and companies. Allianz Allianz Does invest in oil and gas companies. Has the following restrictions on coal investments: Allianz does not invest in companies that derive more than 30% of revenue from coal mining, generate over 30% of their energy from coal or are planning over 0.5GW of thermal coal capacity additions. Will no longer provide stand-alone insurance coverage for the construction and operation of coal-fired power plants or coal mines, but can still provide cover for coal companies for now. All insurance related to coal will be gradually phased out by 2040. Does underwrite oil and gas companies and infrastructure. AM&T Allianz Does invest in oil and gas companies. Has the following restrictions on coal investments: Allianz does not invest in companies that derive more than 30% of revenue from coal mining, generate over 30% of their energy from coal or are planning over 0.5GW of thermal coal capacity additions. Will no longer provide stand-alone insurance coverage for the construction and operation of coal-fired power plants or coal mines, but can still provide cover for coal companies for now. All insurance related to coal will be gradually phased out by 2040. Does underwrite oil and gas companies and infrastructure. Apia Suncorp Invests in coal, oil and gas companies. Has committed to its fossil fuel investments being “immaterial” by 2019. Has not provided a figure for what “immaterial” represents. Does insure coal, oil and gas infrastructure and companies. Asteron Suncorp Invests in coal, oil and gas companies. Has committed to its fossil fuel investments being “immaterial” by 2019. Has not provided a figure for what “immaterial” represents. Does insure coal, oil and gas infrastructure and companies. Bingle Suncorp Invests in coal, oil and gas companies. Has committed to its fossil fuel investments being “immaterial” by 2019. Has not provided a figure for what “immaterial” represents. Does insure coal, oil and gas infrastructure and companies. CIL Suncorp Invests in coal, oil and gas companies. Has committed to its fossil fuel investments being “immaterial” by 2019. Has not provided a figure for what “immaterial” represents. Does insure coal, oil and gas infrastructure and companies. Club Marine Allianz Does invest in oil and gas companies. Has the following restrictions on coal investments: Allianz does not invest in companies that derive more than 30% of revenue from coal mining, generate over 30% of their energy from coal or are planning over 0.5GW of thermal coal capacity additions. Will no longer provide stand-alone insurance coverage for the construction and operation of coal-fired power plants or coal mines, but can still provide cover for coal companies for now. All insurance related to coal will be gradually phased out by 2040. Does underwrite oil and gas companies and infrastructure. GIO Suncorp Invests in coal, oil and gas companies. Has committed to its fossil fuel investments being “immaterial” by 2019. Has not provided a figure for what “immaterial” represents. Does insure coal, oil and gas infrastructure and companies. InsureMyRide Suncorp Invests in coal, oil and gas companies. Has committed to its fossil fuel investments being “immaterial” by 2019. Has not provided a figure for what “immaterial” represents. Does insure coal, oil and gas infrastructure and companies. Just Car Suncorp Invests in coal, oil and gas companies. Has committed to its fossil fuel investments being “immaterial” by 2019. Has not provided a figure for what “immaterial” represents. Does insure coal, oil and gas infrastructure and companies. QBE QBE Invests in oil and gas companies. Has set a target to withdraw all direct investment in thermal coal companies (that generate over 30% of revenue from coal or generate over 30% of electricity generation with coal) by 1 July 2019, and introduce a 0.5% limit on indirect investment (e.g. index funds) thermal coal exposure. Does insure oil and gas infrastructure and companies. From 1 July 2019 QBE will refuse to insure new thermal coal mines, power stations and transport networks. It will phase out its entire thermal coal underwriting (insurance) business by 2030. Resilium Suncorp Invests in coal, oil and gas companies. Has committed to its fossil fuel investments being “immaterial” by 2019. Has not provided a figure for what “immaterial” represents. Does insure coal, oil and gas infrastructure and companies. Shannons Suncorp Invests in coal, oil and gas companies. Has committed to its fossil fuel investments being “immaterial” by 2019. Has not provided a figure for what “immaterial” represents. Does insure coal, oil and gas infrastructure and companies. Suncorp Suncorp Invests in coal, oil and gas companies. Has committed to its fossil fuel investments being “immaterial” by 2019. Has not provided a figure for what “immaterial” represents. Does insure coal, oil and gas infrastructure and companies. Terri Scheer Suncorp Invests in coal, oil and gas companies. Has committed to its fossil fuel investments being “immaterial” by 2019. Has not provided a figure for what “immaterial” represents. Does insure coal, oil and gas infrastructure and companies. Territory Insurance Office Allianz Does invest in oil and gas companies. Has the following restrictions on coal investments: Allianz does not invest in companies that derive more than 30% of revenue from coal mining, generate over 30% of their energy from coal or are planning over 0.5GW of thermal coal capacity additions. Will no longer provide stand-alone insurance coverage for the construction and operation of coal-fired power plants or coal mines, but can still provide cover for coal companies for now. All insurance related to coal will be gradually phased out by 2040. Does underwrite oil and gas companies and infrastructure. Tyndall Suncorp Invests in coal, oil and gas companies. Has committed to its fossil fuel investments being “immaterial” by 2019. Has not provided a figure for what “immaterial” represents. Does insure coal, oil and gas infrastructure and companies. Vero Suncorp Invests in coal, oil and gas companies. Has committed to its fossil fuel investments being “immaterial” by 2019. Has not provided a figure for what “immaterial” represents. Does insure coal, oil and gas infrastructure and companies. Regulators, including APRA here in Australia, have started to wake up to “potentially system-wide” financial risks posed by climate change. They are calling on the insurance industry to take its rightful position as a leader in public discussion on the issue. In 2018 IAG and the NZ Reserve Bank warned the effects of climate change will render huge swathes of the globe uninsurable. The same warning was made specifically for Townsville after its record-breaking floods in February 2019. According to Munich Re, during the three decades to 2012 Australian weather-related insurance losses rose fourfold. The world’s largest reinsurance company warned in March 2019 that global warming, fueled by the fossil fuel companies that Suncorp and QBE currently underwrite, is on track to make insurance unaffordable for low and average income earners in some regions, causing serious economic and social disruption. The trend is clear. Without significant and urgent action in both climate change mitigation and adaptation, insurers face shrinking markets and growing and less predictable natural catastrophe claims. Thanks to customer, shareholder and general community pressure, insurance companies are finally starting to shift away from supporting coal, oil and gas. 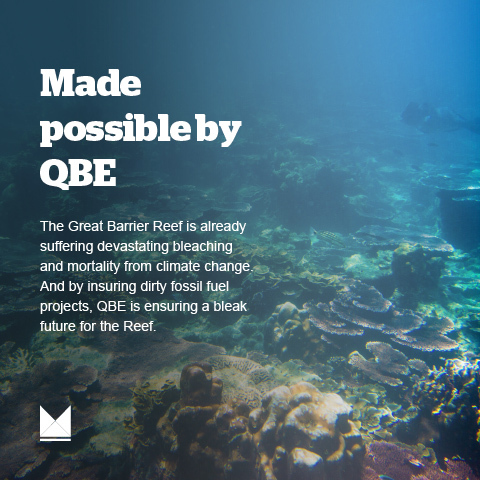 QBE is ending its underwriting of new thermal coal projects in 2019 and will phase out its entire thermal coal business by 2030. IAG and Suncorp have claimed that they are divesting from fossil fuels in their investment portfolio – but are yet to provide the information to verify these claims. In addition, after being missing in action on global warming for years, the Insurance Council of Australia, the peak body for the three big Australian insurers, has begun to criticise government inaction on the climate emergency. However, if the Insurance Council and its members want credibility on the issue, they need to urgently put in place plans for entirely phasing out their support for fossil fuels. It’s widely known that the effects of global warming are increasing the frequency and severity of natural disasters. But insurance companies are struggling to keep up with this changing climate, as all major general insurers have been hit hard by natural hazard claims recently. In eight of the last 10 years, Suncorp have under-provisioned for natural hazards, with claims exceeding provisions by almost $1.7 billion over that timeframe. During that same period, IAG’s annual natural hazard payouts have exceeded provisioned (the amount that had reinsured for) amounts seven times, with the shortfall totalling $733 million. QBE doesn’t report its provisioning in the same way as the other two big insurers, but we know that since 2011, QBE has paid out $12.2 billion on natural hazard claims. This equates to 11.4% of the company’s Net Earned Premium, which is a huge jump from the 8.1% of Net Earned Premium that was paid out on natural hazards in the 7 years before 2011. These figures highlight the growing difficulty insurers are facing as they try to predict potential payouts and price their premiums accordingly. The inability to properly price risks has raised concerns that some of Australia’s most disaster prone areas may be inadequately covered by insurers. The problems facing the industry were noted in a September 2015 report published by the Bank of England’s Prudential Regulation Authority (PRA), which found that insurance losses from natural disasters in the UK have increased five-fold since the 1980s, and predicted that these losses will only increase in a changing climate. The report also highlighted two further categories of risk posed by climate change: transition risks and liability risks. Transition risks arise from the transition to a low-carbon economy, such as the repricing of carbon intensive assets as some reserves are left stranded under strict carbon budgets. Liability risks are posed by the increasing likelihood of claims for loss and damage suffered as a result of climate change being levelled against companies and directors who have significantly contributed to the problem. Experts have warned that keeping global warming below 1.5°C requires an end to new fossil fuel projects, and the early closure of many already operating. 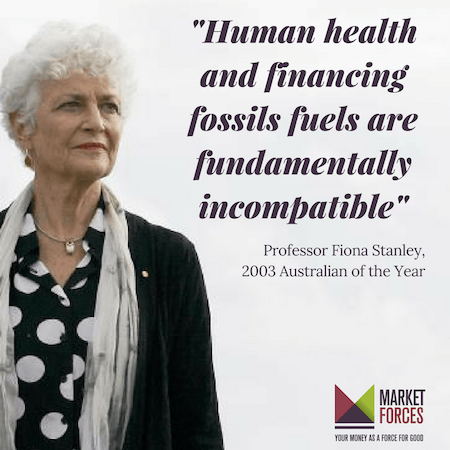 Despite this, here in Australia Suncorp and QBE continue to support the expansion of the fossil fuel industry by underwriting – that is insuring – new fossil fuel projects. This includes everything from coal mines and gas fields to ports, railways, pipelines, oil rigs and even coal and gas-fired power stations. These expensive projects face serious physical, legal, political and management risks, and the vast majority would not go forward without some kind of insurance cover. Positively, QBE has announced a phase out of its thermal coal business, but will continue to underwrite dirty oil and gas projects, and Suncorp has yet to take any action in that area. AXA, the world’s biggest insurer, no longer underwrites projects of companies that derive 50% or more of their revenues from coal. Swiss Re, the world’s biggest reinsurance company, doesn’t offer coverage for coal power stations, coal mines, offshore drilling in the Arctic, greenfield tar sands projects, and unless certain conditions are fulfilled, hydraulic fracturing (fracking). ERGO, a subsidiary of Munich Re, does not cover oil drilling in the Arctic either. Allianz has stopped underwriting coal mines and coal-fired power stations. Many other insurance companies have adopted Environmental, Social and Corporate Governance policies that offer general guidance but do not rule out coverage of coal projects and other destructive sectors. The global insurance industry accounts for about a third of all assets under management – somewhere in the vicinity of US$30 trillion. As some of the world’s biggest investors, insurance companies have a responsibility to support the sustainable transformation of the global economy. Yet despite their rhetorical concern on climate change, most insurers remain major investors in the coal, oil and gas sectors. In February 2017, London-based insurance giant Lloyd’s reported on the massive scale of potentially stranded fossil fuel-related assets, finding the global insurance industry is particularly exposed, and therefore vulnerable. The Lloyd’s report recommends insurers stress-test their portfolios against potential devaluation of carbon-intensive assets, and also actively contribute to legislative and regulatory development to help reduce stranded asset risk. General insurers in Australia manage more than $80 billion, making them some of the biggest – and therefore most influential – asset managers in the country. QBE has committed to dumping all thermal coal companies (companies that make over 30% or revenue from coal or produce more than 30% of electricity from coal) from its “direct” investment portfolio and put a limit of 0.5% thermal coal exposure across its entire portfolio by 1 July 2019. Suncorp and IAG claim to be reducing fossil fuel exposure in their investment portfolio, but have yet to provide any proof or further information. Find out more about the health insurers ignoring the urgent need for a safe climate future. Is your insurer one of them?